FOIMan unveils a forthcoming book seeking to define the role of the FOI Officer and provide help to anyone struggling with the management of their organisation’s FOI obligations. If you are employed as a FOI Officer, or even just do a job that involves dealing with a lot of FOI requests, one of the problems has always been that there is no manual. Until now. 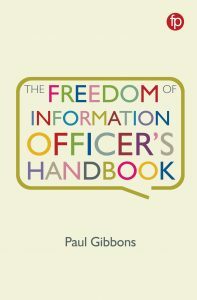 Later this year, Facet Publishing will be bringing you The Freedom of Information Officer’s Handbook, a new book about FOI by…well, me. Yes, I referred recently to my relative silence online in recent months, explaining that this was partly down to the demand for GDPR training over the last few months (which continues), but also hinted at another mystery time-consuming commitment. I can now reveal that the latter has been (and continues to be), the writing of this book. This will be my first book (and perhaps my last! ), which is obviously exciting for me, but hopefully also an interesting development for those of you who have followed this blog over the last few years. There are plenty of places to find guidance on FOI, and even other books that explore FOI from a legal perspective, focussing on the application of exemptions for example. 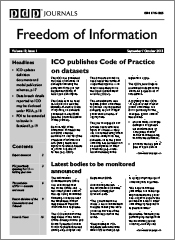 However, there isn’t anything (to my knowledge at least) that provides a comprehensive guide to how FOI should be managed by public authorities. So whilst you will find useful summaries of the law and how exemptions should be applied in this book, you will also find guidance on best practice when it comes to administering FOI. A chapter on embedding FOI in your organisation will include the development of policies and procedures, and how to assess and address training needs. 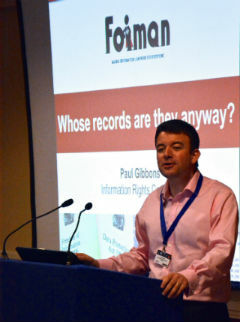 Another on managing FOI will look at the IT systems that can be used to log requests, and how to improve performance, amongst other things. Some of you will have been lucky enough to receive FOI requests from me over the last year,* and the answers to those requests, together with my own experiences over the last 15 years, and other published research on FOI, will bring a fresh perspective on how FOI should be managed. A really important thing for me in proposing and writing this book has been to explore the role of the FOI Officer. FOI is still relatively new, and whilst I often refer to FOI Officers in this blog and elsewhere, there aren’t actually that many people who answer requests that are called ‘FOI Officer’ within their own organisation. They often have to fit FOI work around other responsibilities. The work of those involved in FOI management, and the challenge they face, is often hugely underestimated by both requesters and by their colleagues and managers. In this book I hope to cast some light on their work and help those in these roles to be better appreciated by both others and (perhaps more importantly) by themselves. The book won’t ignore related legislation either. The Environmental Information Regulations will feature heavily, and a chapter on copyright and re-use will discuss the Re-use of Public Sector Information Regulations and how they interact with FOI. There will also be brief descriptions of how the various FOI laws from around the British Islands (Scotland, Ireland, Isle of Man, States of Jersey) differ from the UK one that is the focus of the book. Finally, the book offers the opportunity to provide an updated vision of FOI management in the context of the latest developments. In particular, I’ll be looking at what GDPR means for FOI, both in terms of compliance, but also considering what lessons there might be from concepts such as Data Protection Officers and data protection by design. The new s.45 Code of Practice will obviously feature (and I’m hoping the finalised version will be published in time to be referenced!). The book is obviously aimed primarily at practitioners and others working in public authorities. However, just as this blog has proved to be of interest to a wider audience of journalists, academics, and other users of the Act over the last few years, hopefully the book will also appeal to those outside the public sector curious about how FOI works in practice. * And more seriously, a very big thank you to everyone who has answered FOI requests from me or helped in any way over the last few months – it is hugely appreciated.